Thank you for the kind words! I'm glad I could pay forward the inspiration that others have brought me! This is seriously some impressive work you're doing. Keep it up! I think it's the black bumpers and wheels. I've been hearing that a lot lately! Some of you who I've kept up with through PM's know I've been out of commission since September due to a neck injury (C5-C6 spinal disc herniation). Times were tough, but with proper care and regular therapy I'm on the mend and finally feeling normal again. 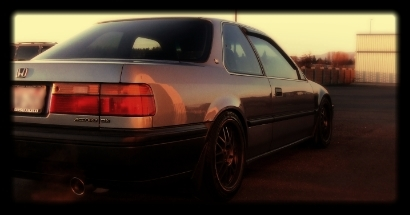 The CB7 is still running strong and doing well. My suspension and PS delete made it a challenge to drive in that condition, so I kept it to a minimum. 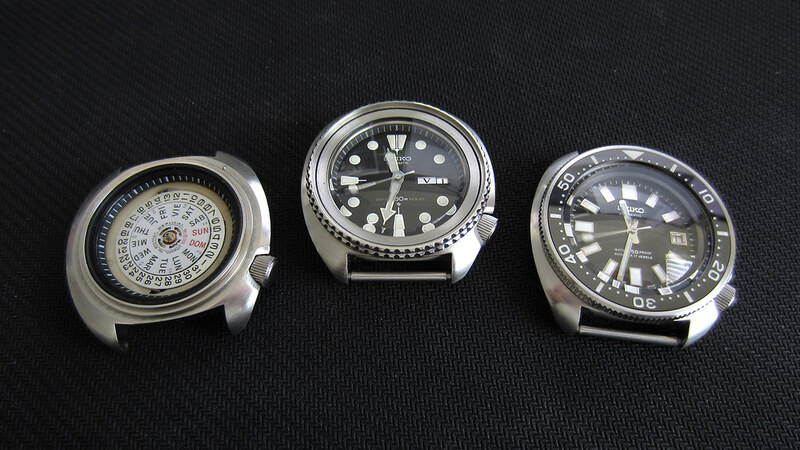 For anyone interested, these are my Seiko 6309 "turtle" divers, left to right showing the progress of the builds. - Left is a 6309-7040 from 1984. It's waiting for the dial, hands, crystal, bezel and insert. - Middle is a 6309-7049 (US market version) from 1980. This one is an awesome specimen in fantastic condition. Everything about it is original except for the addition of a domed Hardlex Type 3 crystal designed for the earlier Seiko 6105 diver. I'm just waiting on an OEM spec bezel insert. - Right is a 6309-7040 from 1980. I just finished this one up. It has an aftermarket dial and hand set intended for the 1965 Seiko 6217 (Seiko's first professional diver). I like the contrast of rectangular hour markers to the roundness of everything else around it. It sports a sapphire crystal modeled after the 6105 Type 2 Hardlex, a coin edge bezel and ceramic insert with lume filled indicies. Off topic, I know, but this is what's been keeping my occupied while I "take it easy" on my mission to 100%. I'd rather share this with you guys than on a watch forum anyway. P.S. I'm really glad to see all of the other member ride threads continuing to evolve! I want to post on each and every one right now, but there are so many with so many new posts that I'll have to update myself on the builds one at a time! Apalileo, glad to see that your back and the Accord is well. I was just thinking about what had happened to you a week or so back. Glad to hear that your able to take it easy and get fully recovered. Those are some very nice watches indeed. Not that I really know anything about watches. I always enjoy checking in on this build. Excellent modifications executed with top notch work. I chose the X-Lenses specifically for their rectangle shape. I feel they compliment the CB7 headlight perfectly. The cutoff on these is interesting though. The center is your typical straight line with the step up on the passenger side, but on the far right and left, it arcs downward. It's got something to do with the way the lens is cut. I guess flattening out the sides to create the square has that effect on the way light passes through. With 55W 5000K D2S bulbs, they're fantastic! Any shots of the output? I was back-tracking through the thread and noticed the rigid collars I somehow missed before. Where did you find those? Cyborg they are on ebay if you search for "spoon rigid collar". I need to get a set for the front and rear of Lola. It's on the list. Last edited by Rilas; 06-18-2018 at 10:03 PM. I'm honestly surprised Spoon made anything specific to the CB. Probably only because they fit the Torneo as well. Sickest DX I've ever seen! Major props bud! 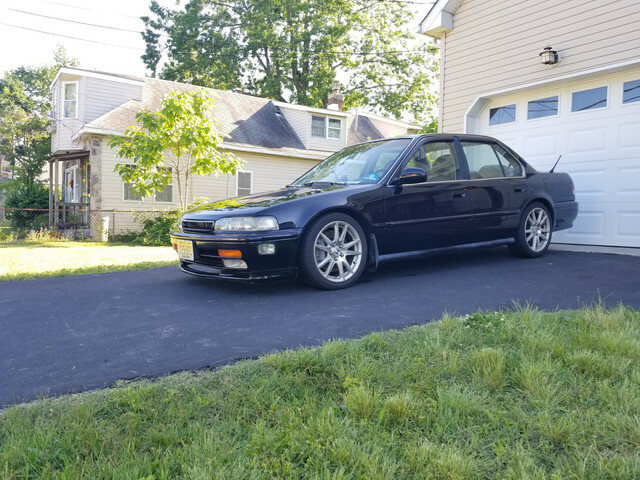 So if they are chassis specific I can’t seem to find any for the cb7, cb3. What chassis did you use? Or do you have a link to who you purchased them through? 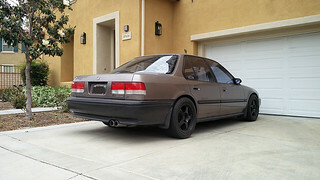 They show up for the CB6 which is the JDM/EDM coupe's I believe, not like it matters as the sub frames are all the same. islandhopper - Thanks for the kind words! 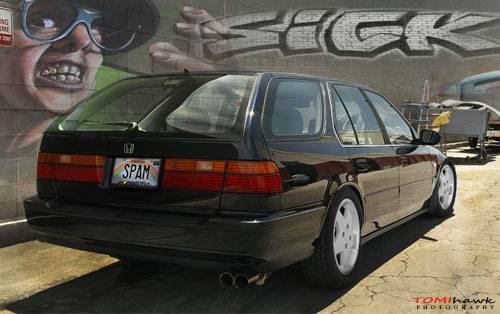 I don't actually have any light output shots, but I will try and snap some if I take the CB7 out for a night drive. CyborgGt - I picked mine up off of Ebay. Part number 50261-BB8-000 and while intended for the BB8 Prelude, it was applicable to the CB7. IIRC it stated Prelude/Accord on the box label. Rilas - Thanks for chiming in. I don't visit the forum as much as I used to. I saw I've got a lot of catching up to do on Lola! PakaloloHonda - Thanks! As time goes by, the DX charm just grows! Grumpys93 - No link, but if you search the part number I listed above on Ebay, there are a few listings. Rilas (again) - You're a genius! I never thought to search "Rigid Collar CB6" on Ebay. I always centered on CB7 so I only ever saw the listings for the front set. Rear set is BB6 centric, but is CB6 applicable: 50300-BB6-000. Something to add to the wish list. June 2018 - No Upgrades, Just Work. No Pics. For the first time in months I turned a wrench, and it was sorely missed. Earlier this year I noticed a vibration developing at freeway speeds (65-75 MPH). I had my wheels and tires checked for balance on a Hunter Road Force machine and they proved to be well balanced still. While on the rack, the tech let me sneak under the car and I checked all the links, arms, bushings, etc. I ended up finding some "wiggle" in my driver CV axle. I set about purchasing CV axles, both left and right, from Napa. They had new ones in stock at my local store (surprising). Visually my current CV axles seemed fine. No torn boots or grease leaks, but once off the car both of the CV axles were quite "limp" at the joints. I finished it off with a drain and fill using Honda MTF. While at it, I performed an oil change. Conventional 5W30 with an OEM Honda filter. This got interesting. My last oil change was not performed by me due to my physical impairment at the time, but I had brought a filter and crush washer to a local shop and had them do it. What I found during this oil changes was some no-name big huge white oil filter on the back of my block. I couldn't even fit my filter socket onto it. I ended up wrapping it in a couple of nitrile gloves and fighting it off bare handed. The washer wasn't even the same one that I provided to them. I had to grab the washer with a vice grip and unscrew the drain bolt from it. Needless to say, I'm going to have a word with them (fully aware they have no record of it and will likely have no "recollection" of such). Sometimes you just have to call people out on their BS. I took the CB7 out on an afternoon drive and the vibrations have been eliminated and all is good in the world. I don't know exactly what's next, but I have a few ideas floating in my head! It is always nice to turn a wrench. Next time you have issues with the oil filter. Just stab it in the side with a philips head screwdriver and that should give you enough leverage. You will just spill a little oil out but makes it easier to remove it. Damn... that's brilliant. I hope to never have to use this info, but it's great to have. This is a perfect example of a "why didn't I think of that" moment. Wow, I can't believe you gave them the parts & they did not even use them. Glad you sorted out your vibration issues. CV axles are so wacky sometimes. If you could do it all over again, would you buy a longer rear spring for the rears to compensate for additional distance between the perch location and the point on the shaft where the top hat sits relative to the front? Back in 2016, you mentioned having to adjust the collar down 1-1/8" from where you had it preset once you got it on the car. Even in your picture, your helpers were near full extension. I get that you don't have anything loose in there and that longer springs aren't NEEDED in order to have the suspension operate, but I'm just asking if you would do it differently. 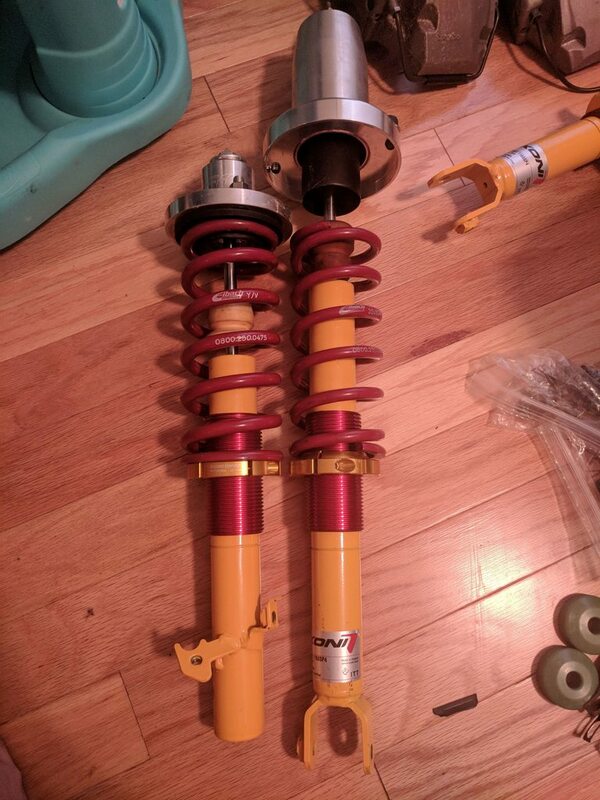 I finally bought a pair of helper springs to go with my rear Ground Controls, but because I have the Cheddas Auto rear top hats that are skyscraper tall, I'm wondering if I should get longer Eibachs to take advantage of the additional length now that the shock can be at full extension. My current rears are 8" 300lb. springs. Jarret - From my observation, I wouldn't change anything. If I were to swap in a 9" rear spring in place of the 8" without moving the perch, the car would sit higher out back. I would then have to lower the perch (most likely 1") to get back to the current ride height and then the helper would be back to the same amount of extension. The conclusion I came up with when I was considering the Cheddas rear extended top hats is that the extension of the helper will not change since the extended top hat is only repositioning the strut in order to regain the ideal stroke range for the piston. The position of the upper spring perch is unchanged. The lower spring perch would sit lower on the sleeve, but that's because of the higher orientation of the strut body and the sleeve. There would not be any added extension on the springs when in full droop as the upper and lower spring perches would ideally keep the same distance at full extension of the strut (in comparison to the OEM rear upper top hat). I'm also running 8" 300 lb/in rear springs and with the 6" helpers and as you know I've not once had an unseating issue. I thought about longer helper spring, but the 6" was the longest I'd come across when suspension shopping. Last edited by apalileo; 07-11-2018 at 08:53 PM. Here's my issue. If you set the sleeves on the same perch and thread the collars to the same relative point, then an 8" spring on both no longer spans the gap from the collar to the top hat on the rear. Amazon was out of 6" helper springs, so I bought the 4" CS100s, instead, and that seems to take up much of the space. I just want to make sure that I have an effective spring that matches most of the usable range of the shock travel. If the shock in full extension (as pictured) matches the highest point of its travel, then it seems like the standard setup without helpers would be incredibly prone to coming unseated when that corner reached full droop. I'll see how everything goes with the added CS100s, but it was just something that made me curious. Last edited by Jarrett; 07-12-2018 at 11:24 AM.